Is an 1100hr certified Hot and Vinyasa yoga teacher. He has studied Hatha, Vinyasa, Bikram, advanced Bikram, Dharma, Kundalini and Kriya yoga. He's studied under Lighthouse Yoga’s Jared Mccan, as well as world renowned instructors Rose Erin Vaughn and Yoshio Hama. Chauncie originally studied Dance & Theatre for 11 years with American Ballet Theatre, Dance Theatre of Harlem, Creative Outlet Dance Theatre of Brooklyn, Complexions Contemporary company and Fiorella H.Laguardia High School where he studied Dance & Theatre for 4yrs. He continues to further his knowledge by studying herbal medicine, history jiu jitsu and capoeira. Chauncie is a firm believer in studying so he can be of better service to his community. He seeks to spark inspiration within his students to create internal change. He travels every year to deepen his understanding of cultures and their traditions. I have found a significant increase in my range of motion, improvement in flexibility, increased speed, prevention of injuries, and overall enhancement in health, well­being, and mental awareness when yoga is incorporated into my training. 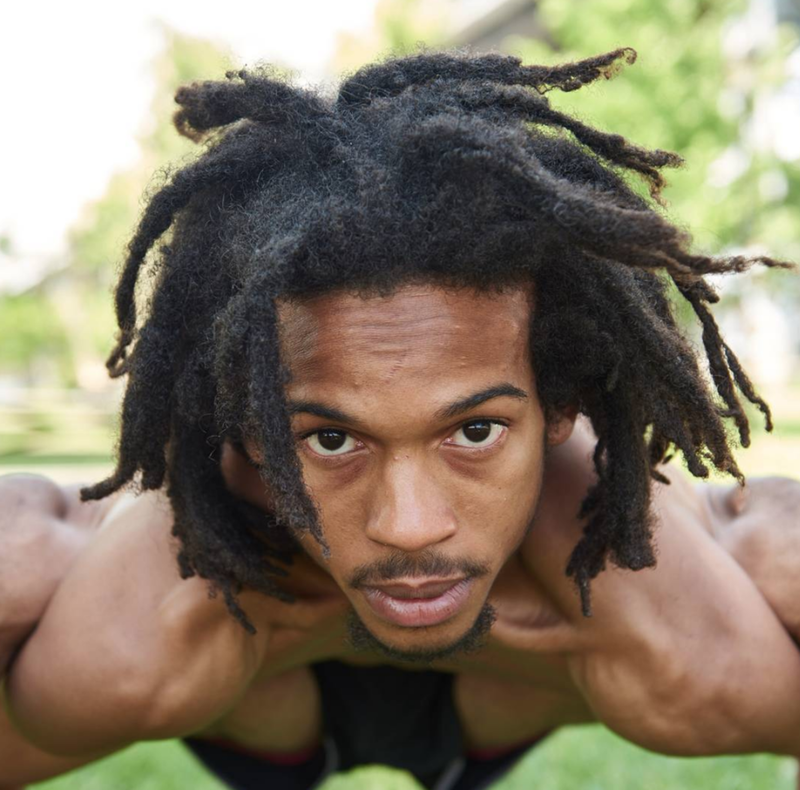 Yoga became apart of my life after college, when I pursued my professional football career. It was one of the best decision I ever made for myself. The particular style that I take is the 26- postures +2, also know as Bikram. Yoga fits into all aspects of my life. I've become more aware of my senses toward myself, knowing how to use my breath while I run in a more calm way. I've learned how to control my breath when my heart is beating a thousand miles per minute keeping my composure as I run. Not only has this helped me on the football field it has also help me through everyday life figuring out problems in a more conscious way. My favorite yoga pose is standing forehead to knee (DANDAYAMANA-JANUSHIRASANA) this is a pose where you must stay present. Wherever you are in this posture you must work where you're at. This posture is always about the journey never the destination. What I’ve learned through yoga is: pace yourself, don't burn yourself out. And know that every day is different, so your body and mind won't feel as great or the same as that other day, or bad. It's all about the journey. What are what are we making? L.T: We're going to have some collard green ribbons which I'm doing as a really thin chiffonade so that they can be buttery and really easy to eat and chew and just melt in your mouth. We’re also going to make some faro with black-eyed peas and with bell pepper, a little bit of squash and a few other vegetables like zucchini and things like that. So since my grandmother passed away– a lot of foods that she would make would include greens or black-eyed peas and things like that, so I wanted to make something that would nod to her and the ingredients she would use in most common cooking. There's a big African American tradition around having black eyed peas around the New Year. It's kind of for good luck that you have them. It brings you money and prosperity. It's something that I just incorporate in a lot of cooking I do. I don't want blessings to be bestowed at January 1, I want blessing throughout the year! What does it mean in the wellness space to create “safe space”? It’s a term thrown around a lot, but I’m not seeing many spaces that really live up to full capacity of what it suggests. L.T: It’s so important to go into wellness spaces, or conferences, or gatherings or whatever it is and see a diversity of leadership. You may go to an event and you'll see all of these amazing people and you're like “Wow, look at this incredible group of individuals from all ages and sexes..” but not necessarily backgrounds. It's so important. Right now, the voices of women and women of color in the wellness space are marginalized. And their voices are . . . not silenced, but not celebrated. I think with people of color too there's a barrier to come into yoga or meditation if you feel like you have to dress a certain way, that you have to have this type of legging which costs this much. This weight. This eye color, hair color, body type. That's what we see perpetuated in wellness media so people aren't going to think it's a space for them. There's a problem with trying to act like everything is one way when really there are so many unacknowledged people who are lending their voices and work. And not just for people of color but also making sure that we bring voices from the LGBTQ community. I talk to so many people who are like, "I don't want to come into this space. There's so much hetero-normative languaging" or even just the framing. And so people might not feel safe in a space where they have to fight for their existence. If you're going to be about consciousness, if you're going to be about inclusivity and you're going to be about lifting people then you have to lift and want to liberate all people. I think that that's what we have to work towards – making sure that you can go into a studio and also see "oh, my trans sister that I take yoga with" or like this black brother who teaches class. Also! A lot of these tips and tools and traditions are coming from ancestral traditions, globally, that are being repackaged, spun, and sold to people without the context of where they came from. So I think we have to do better at that. Making sure that we lift all types of voices in leadership. I think it's so important there are spaces that are also spaces designed specifically for these communities, too. There’s a certain freedom, at least for me, in the way I move about in a space I feel at home in. L.T: I think there is a difference between how marginalized communities move because people who don't always feel safe are always questioning whether or not they belong some place. People who feel safe are always transgressing people's boundaries. It's like when you go on the subway and somebody's man-spreading. And it's like, I would never think to take up that much space. Your consciousness tells you that it's OK for you to take up that much space? Whereas a woman or someone else is making themselves smaller. Not to say that we should be making ourselves smaller! But how do we frame around taking up more space intentionally and consciously because, in marginalized communities, we've never been able to. I want people to take up more space. I want women to take up more space. I want people of all backgrounds who have been walking with their wings clipped to take up more space. And it's important too, because the work that these people bring to the world is really profound. And it will only come to fruition if we're allowed to take up that space. L.T: That's what it is. Taking that responsibility. Own it! Embrace who you are to your fullest so that you can become the brightest light and that everything you touch will be graced. If you hold back in any way on who you truly are, if you don't really let the world see you, or give the gifts that you have to give, then people suffer. The world really suffers when you're not yourself, when I'm not myself. Because there's special medicine that we were sent with that is ignited when you and I activate who we are. That's balm that heals the world. We're supposed to do that. That's what we're here to do. Just do it. So that's done, and I'll make you all dessert. My name is Claudia. I’ve been practicing yoga for about a year and a half. I have a background in dance and acting but stopped taking dance classes because they were too expensive and the pressure to have a dancer’s body was too much of a burden to bear. Yoga came into my life right when I needed it. I have found a deep connection to myself, my purpose and a community of loving and compassionate people through my journey so far. At first I looked at yoga as a poor man’s dance class. (Terrible… I know). Before I really started to practice yoga, I saw it as a bunch of movements and nothing more. Then a year and half ago, I took a class; there was a moment where I felt something new. I felt okay. I’ve suffered from eating disorders, depression and anxiety for as long as I can remember. But in that moment, those things that had plagued me weren't an issue. For some reason when my eyes were closed in hero’s pose, I felt content. I felt a connection between my body, breath and mind. It didn’t rid me of my depression but it was a relief to say the least. From then on I was hooked. Claudia taking a Hot Yoga Class in NYC. I have been teaching dance for over a decade and thought learning how to teach yoga could be the way that I give back to a community that gave me so much. Through that process, I found my strength and my purpose. Spreading the healing powers of yoga has been such an eye-opening experience to the potential that I have as well as the potential that I often times try to hide. I’ve learned that that’s what yoga is all about - being aware of yourself for who you really are and not just the “you” that the world sees. This investigation of self keeps me curious and keeps me on my mat and teaching whenever I can. I am so grateful for this community and the honesty and vulnerability that we bring. I can’t wait to spread even more love and acceptance of self for all people no matter what body type or shade of skin. We all deserve the healing that yoga provides! This Month's Full Moon: Wednesday, September 6, 2017. On Wednesday morning, a Full Moon occurs, when the Sun in Virgo forms an opposition to the Moon in Pisces. The Virgo-Pisces polarity is the service axis, and it deals with the balance between day-to-day functions and routines, physical health, and the need for order (Virgo) and vision, spiritual health, disorder, and the infinite (Pisces). Virgo rules our personal set of tools and techniques that we use to deal with day-to-day life, while Pisces rules the tools that we use to deal with our spirituality. The key to balance lies in identifying and expressing our spiritual needs while maintaining order in our everyday lives. Neglecting either end of the axis will surely backfire–we would either be living in chaos or in excessive order. This Full Moon is tightly tied to Neptune and this can be a dreamy, inspired time but also one when we can be wrestling with expectations. Catch up with Nina's Full Moon Flow, next month: October 5, 2017. Hello! My name is Donisha. I am a naturally sensitive and spiritual person but my upbringing has made me strong and resilient in a lot of different ways. I’m a daddy’s girl in a household of brothers (LOL). This has made me the fierce and loving person I am today. I am a natural caretaker and supporter – full of empathy and compassion – but I don’t believe in setting myself on fire to keep others warm. I believe that wellness is not a luxury but a necessity; that everyone should be well so that they can have the opportunity to do well. That’s how I found myself working in public health and wellness. The work that I do is informative, supportive and empowering. It is my hope that I can encourage people to make time and create space in their lives to connect with the wonderful gift that is the human body. "Take a deep breath and give yourself a moment." Intuition and anxiety are two things that occur within us naturally and sometimes instinctively. Both can potentially keep us from harm’s way but there is a distinct difference between the two: FEAR. Anxiety is led by fear. It disrupts your peace and causes you to be uneasy. Intuition is something that is peaceful and calming. It comes from a place of support. When your “gut” starts to speak to you, take a deep breath to give yourself a moment to decide if it’s coming from a place of fear OR if your intuition is leading you to something more affirming. HOW TO SCORE A CHEAP flight TO BALI! Want to join us for our Bali Retreat in April? Afraid you can't afford a ticket? It's a bird, it's a plane. No, it's Hopper. The Smartphone App that alerts you anytime your flight becomes cheaper. Just how cheap you may ask? Set a price alert for our Bali Retreat's travel dates right now (April 7th-April 13th) and you may be able to score a $400 ticket to BALI. Yes, I said it, $400. Makes you want to kiss your mama....or a bunny! Don't have time to waste? Want to book Today? Well then Skyscanner is right for you. This one swoop site let's you search and book cheap flights at the push of a button. With options including Roundtrip, One Way, Multi-City and $0 fees, we see why the sky's no limit with this booking site. "Spring Breakkkkkkkkk," (says in James Franco's creepy voice). Someone please take us back to the glory days of being a College Student. Well for those of you living it, this deal is for you! The popular site, Student Universe, makes sipping Mai Tais in Hawaii in March a breeze. This one stop shop, grants students access to thousands of cheap travel items, making you want to go back, back, back to school again! #Coo Ambassadors: Colors of Ohm Ambassadors are yoga teachers and healers in the wellness community who are part of the Colors of Ohm team. #Coo Ambassadors are the face of Colors of Ohm and leaders within their own communities, helping bring wellness to people of color near them. We have Ambassadors all over the country and internationally as well who are each interested in helping and connecting with all of your beautiful souls. Interested in being a #CooAmbassador? #Coo Tribe: Our Coo Tribe is also a major part of our family. These beautiful humans can either be wellness instructors or healers, or simply individuals interested in pursuing wellness opportunities and bettering themselves. Our "Open Letters from #COO," are written by members in our community who are interested in connecting with others and sharing their wellness journeys. Interested in being part of the #Coo Tribe? You already are! Joy, openness, and freedom are all things that we might seek and want in this life. But how do we get there? I am sure you’ve heard the expression “Life is a journey, not a destination.” My personal journey started through dance. A movement of freedom where muscles and bones can take a path and direction that is not socially open in a classroom or office setting. I believe this is why I meet so many dancers in the yoga community. We might have found the missing piece. Living in the world of dance can sometimes bring you into this beautiful bubble with little reminder of breath. Yet the science of breath, pranayama, is the portal that connects our human bodies together. Dancers can sometimes be stubborn, pushing ourselves beyond our limits. That’s why it is important to come back to the mat, bring our conscious into focus and use breath to guide us. If you’d like to connect yoga and dance, try using your creativity by altering a small arm or leg in your yoga sequence. For example, from your warrior I, try bringing your arms by your sides in a fly away position and inhale to lift the back heel. Exhale to ground it back down into the mat. This is a way of transitioning from crescent lunge to warrior I and you can alternate your arms in creative ways to challenge your balance. You can draw stars with your fingertips or make waves with your arms- perhaps even bend and straighten the back leg. From there, create fluidity in your movements so that you are trying new things. Think waves in the ocean or rolling from shape to shape. Remember that this is your body and your practice; there is no right or wrong way. Let it flow my friends and allow your breath to guide you from within. Ayurveda, the study of the science of life, is an ancient healing practice with origins come from India. A more practical, accessible way to think about Ayurveda and living according to its philosophy is to approach it as living in harmony with the rhythms of nature. Its approach to balanced health is that of treating each person according to their unique psychological, emotional and physical condition. Ayurveda emphasizes in its teachings that focus should be on practical, everyday tools that hone our abilities to “pick up on” signals from our environment. What we are surrounded with or what we choose to surround ourselves with, continuously informs us as to what is supportive and non-supportive. I am always encouraging people to go beyond just the elements of ether, air, fire, water and earth. There is actually so much more to this ancient science. It truly is a way of life and is everywhere in our lives and can be applied to so much in your life beyond diet and the five elements. Our entire planet and all that exists within it are made up of five elements: Ether, Air, Fire, Water and Earth. These elements combined make up the Ayurvedic Doshas- vata, pitta and kapha- biological humors that are constantly out of balance. The goal of Ayurveda and yoga is to create balance and harmony within the body, mind, and senses. Summer in the Northern Hemisphere is between June (beginning with the Summer Solstice) and September (Fall Equinox). Pitta season is characterized by being hot, often very humid, sticky and sweaty. For some, this is a welcomed relief from the cold and dark of winter. Some body types enjoy the heat and humidity while others may be absolutely miserable. Those with an aversion to the cold who are predominantly vata dosha often love the warmth that summer brings. Those with a particularly strong pitta dosha tend to loathe the heat and humidity of summer. For those of you with high pitta who are particularly ornery with the combo of high heat, humidity, excessive sweating and maybe more prone to breaking out, I’m offering up some food tips on how to keep pitta in check during the summer months. A key concept in Ayurveda is like increases like. In other words, the more of something you put into your body, the more it will increase that corresponding dosha, thus brining it out of balance. In regards to pitta dosha, one does not want to bring more heat or fire into the body when pitta season is happening or when pitta is running high in the body. You want to cool pitta down. As a rule, during summer pitta season, favor sweet, bitter and astringent foods. Astringent isn’t a normal part of the North American diet but is excellent for keeping cool. Try foods like kale, collards and dandelion greens. Sugar free aloe beverages are excellent for cooling the body during pitta season. Sugar free versions might be hard to find but if you are able to. You can't go wrong with these spices not only to cool pitta but also can aid in digestion. Favor dishes that call for these spices to stay cool during the summer. If like increases like then it’s important to keep the spicy, sour and excessively salty foods in moderation during pitta season. These foods will only increase pitta dosha making symptoms like anger and skin breakouts worse. The key is to eat seasonally. Favor what is featured in the produce aisle at the grocery store or farmer’s market. Eating seasonally will ensure that you are living in accordance with nature’s rhythms but will also help keep pitta dosha in check. I’ve always had the urge to share what I was passionate about. If I found something exciting, it often came bubbling out of me through Facebook statuses, tweets, word of mouth, and direct messaging. In college, discovering and analyzing music was my jam. In many ways music still is very important to me. My desire to share things that I’m passionate about culminated into my company, my innerglow, which is a platform that combines creative expression and mindfulness. I started meditating daily four years ago and it has since had a profound impact on my ability to manage my emotions, appreciate moments, trust my decisions, access creativity and extend compassion to myself and others. I felt compelled to contribute to the growth of a practice that had done so much for me. My hope moving forward is that I continue to be lead by what excites me. Khat Mandu one of our amazing International Ambassadors who will be co-hosting our Bali Retreat in April. Hi, my name is Khat! I am a traveling yoga teacher previously based in Queens, NY and currently living my daydream in Bali, Indonesia! After only a few years of practice, yoga found me in the midst of my chaos. I was making the most money I ever had at 19 years old, in a cozy little cubicle on the 14th floor of Grand Central Station. Sure enough, I realized how much more I longed to trade my perfectly bobby-pinned bun for a messier one, how I wished to move around in comfier clothing than an ironed suit and 4-inch heels, all while trying to soothe my constant itch to trot my little feet to the ends of the world instead of roaming the concrete jungle that I knew like the back of my hand. Yes, that is life for so many others.. But I knew it wasn't for me! Yoga asked me to tune into my truest self. What makes my heart smile? Yoga asked me to be present in every moment, because it's all we really have. What can I release that is no longer serving me? Yoga asked me to understand my monkey mind. How can a few minutes of mindful movement and meditation allow me to be the best version of myself? I've learned that, as humans, we share much more than genetics. We share one planet, it's oxygen, it's resources and it's space. That is why COO sings to me. Our love energy is boundless and takes no physical shape or appearance. I rarely see people of color taking even a quarter of the traveling population. Thankfully, it is growing! But I've partnered with Colors of Ohm to reach out to my brothers and sisters to help them find the confidence to adventure in a gift we all share- travel AND wellness! Yoga had always been there and traveling ran in my family since birth! Why not bridge the two!? I became a traveling teacher after finding small teaching gigs wherever I traveled to. I was asked to teach at an eco-resort in Uluwatu, Bali in August 2016. As the stars aligned one faithful night, I met my now-boyfriend in a steamy hot tub! We now live off a cliff with our two fur-babies and I wouldn't trade this journey for the world. I went from the hustle of 4 jobs in New York City to only teaching yoga and taking on projects that align with my own values! I am so excited to co-host you on the magical island of Bali. She's been waiting for you! Please take off your shoes, rinse off in the Indian Ocean, recharge and rejuvenate yourselves on a week-long immersion with us. Hello! My name is Cydney Tucker, but you can call me CYD. I’m a journalist, yoga instructor and the proud founder of Colors of Ohm. Originally from Jersey City, New Jersey—I’m very much what people would call a “city girl!” I love to explore, meet new people, and find a sense of community wherever I’m living. My background within the wellness space is not unlike most. I fell in love with yoga after being dragged to a Hot Yoga class by my best friend in New York. After an hour and a half of huffing, puffing and expressing how much I hated it, I walked home with an overwhelming sense of gratitude and appreciation for sticking in something that made me uncomfortable. Over the following months I found myself slowly falling in love with yoga, not because of how I looked after doing hundreds of Chataranga’s, but the feeling that yoga left me with: confidence, strength, and mental clarity. As I continued taking classes and other supplemental trainings, I realized that the people around me weren’t necessarily who I wanted to share these experiences with. I started combing social media for other yoga instructors and wellness educators of color, searching for people who also wanted to help others under the umbrella of wellness. I was amazed to see just how many people there are, from all over the world with a universal passion and enthusiasm for wellness--- and yet how disconnected we are. I created Colors of Ohm as an opportunity to unify and grow together on a journey that is not meant to be traveled alone. I can’t wait to share this experience with each and every one of you!